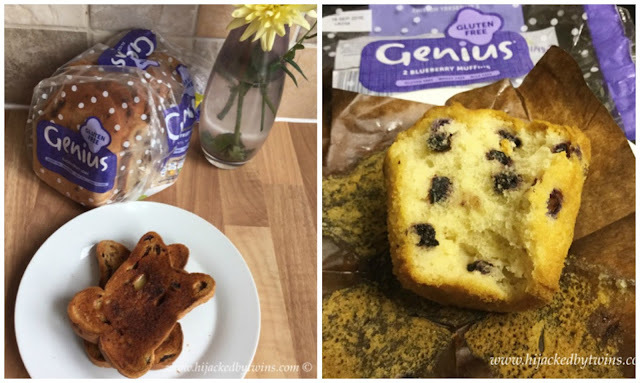 When the people at Genius Gluten Free asked me if I would like to try some of their products I could not wait. Regular readers will know that the hubby is gluten free and I also eat gluten free bread as a lifestyle choice. When the hamper arrived I was excited to try the new products. 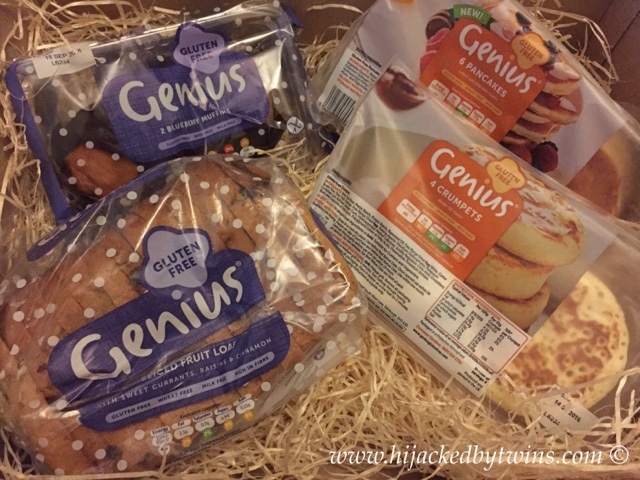 In the past we have tried Genius gluten free bread but none of the products that came in the lovely hamper that they sent to me. 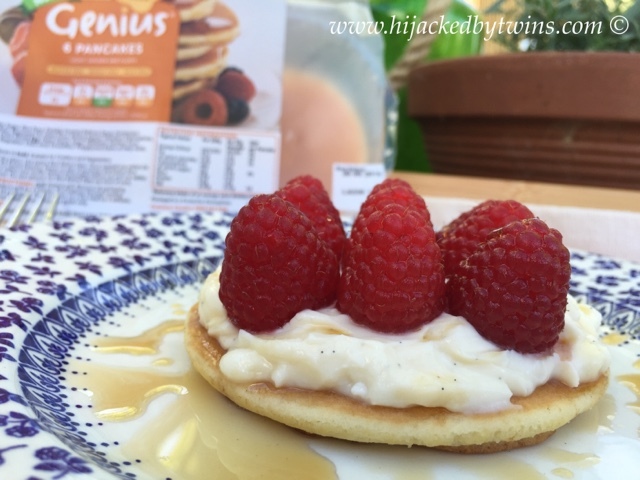 The hubby and J love crumpets and they went straight for them, whereas the pancakes, blueberry muffins and fruit loaf were off limits until I had decided which product I wanted to feature in a recipe. 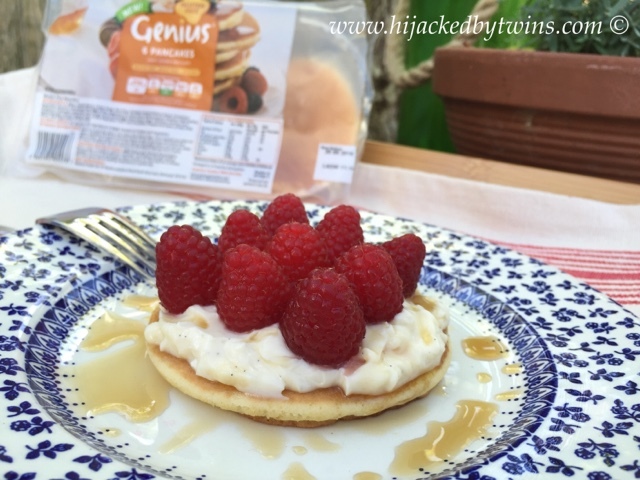 After a lot of thinking I decided to focus on the Genius light, fluffy and golden pancakes. When I tasted their pancakes I really did not notice any difference from regular, gluten pancakes and Genius pancakes. They were everything that you expect a pancake to be. The Spicy Fruit Loaf followed suit. This is another favourite bake of mine. There is nothing more satisfying than sitting and enjoying a piece of freshly toasted fruit loaf smothered in butter. The loaf was packed with juicy raisins, sultanas and currants it has been finished off with cinnamon and, as with the pancakes, it was just as good as a regular loaf. Gone are the days that gluten free bakes are inferior to traditional bakes. They have come so far and are simply as good as regular flour products. As you can see from the picture below the muffin, which in my mind, had the toughest job. But this blueberry muffin was so moist, light and fluffy with the crispy top that you want from a muffin. When I sat and looked that the wide range of products that Genius now have to offer I was astounding by the amount and variety of products. Their array of products goes so much further than just bread. They also make pizza bases, croissants, bagels, sausage rolls, pies, pastry and quiche! After seeing what is now available has left me brimming with ideas for how to incorporate these much loved foods back into our diets! 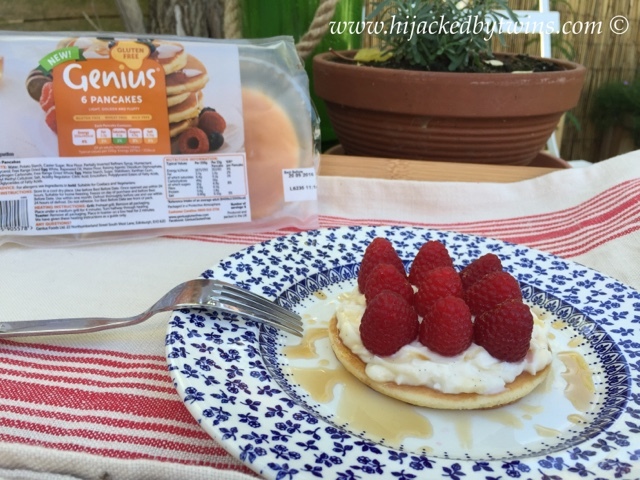 But first let me tell you all about what recipe I have created using the Genius pancakes. 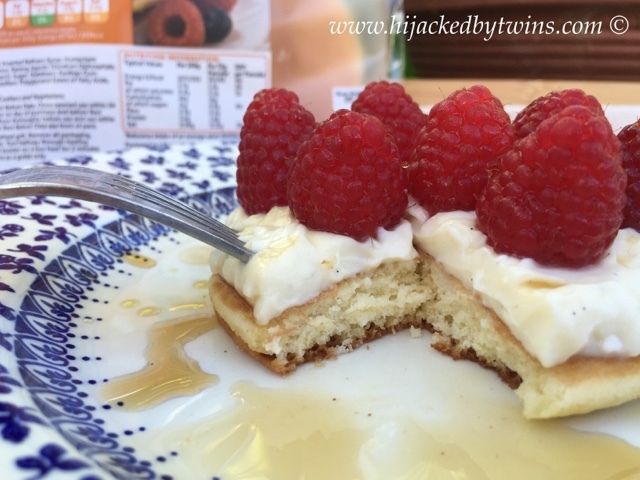 Using the Genius gluten free pancake in the place of a biscuit base makes this family favourite dessert not only a lighter option but a great way to make a quick and easy dessert. 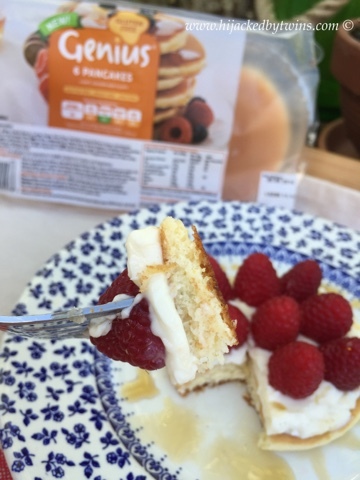 They are also perfect for an indulgent brunch, sat eating in the garden. Trying these new products from Genius has left me wanting to try more of what they have to offer. 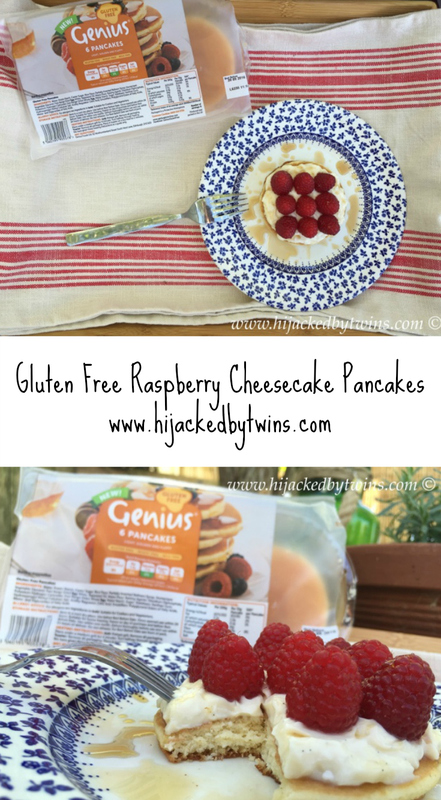 They have all be top quality and delicious products that simply do not reflect how many people think that gluten free products are just not as good. Genius have proved people wrong with their range. 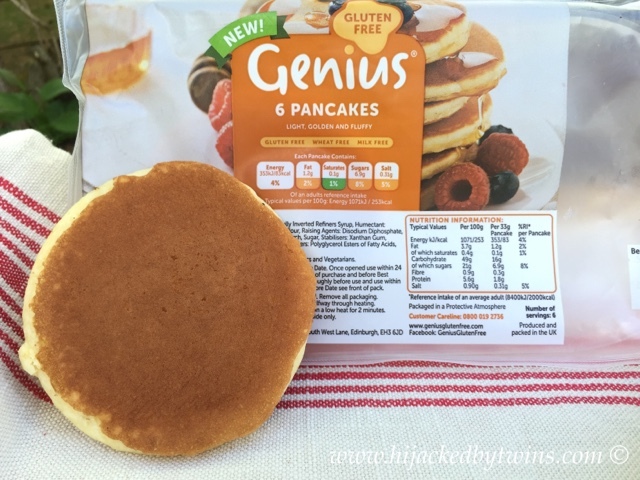 Whether you are gluten free for medical reasons or as a lifestyle choice I definitely recommend trying Genius. I know that I will be trying many more of their products! Disclosure: This post is in collaboration with Genius Gluten Free. All words, views and opinions are my own.